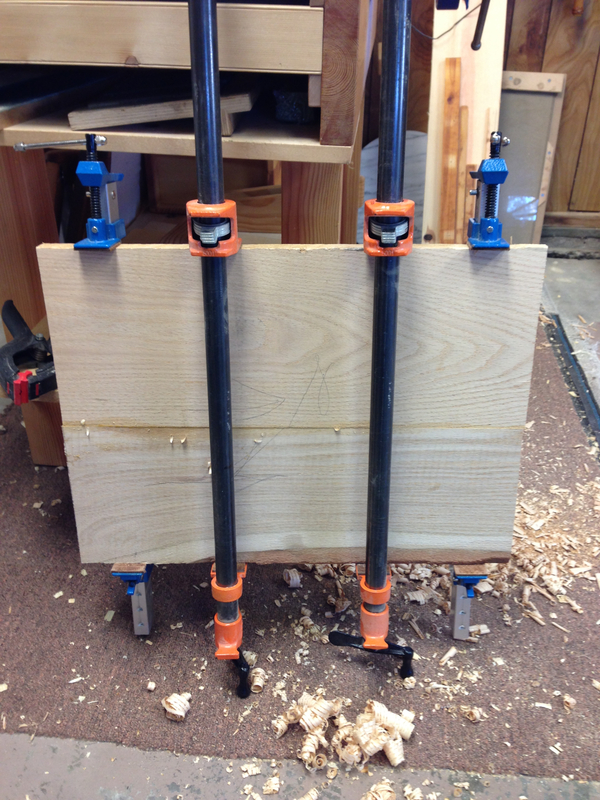 After 24hrs in the clamps I surfaced the panel and sized it. 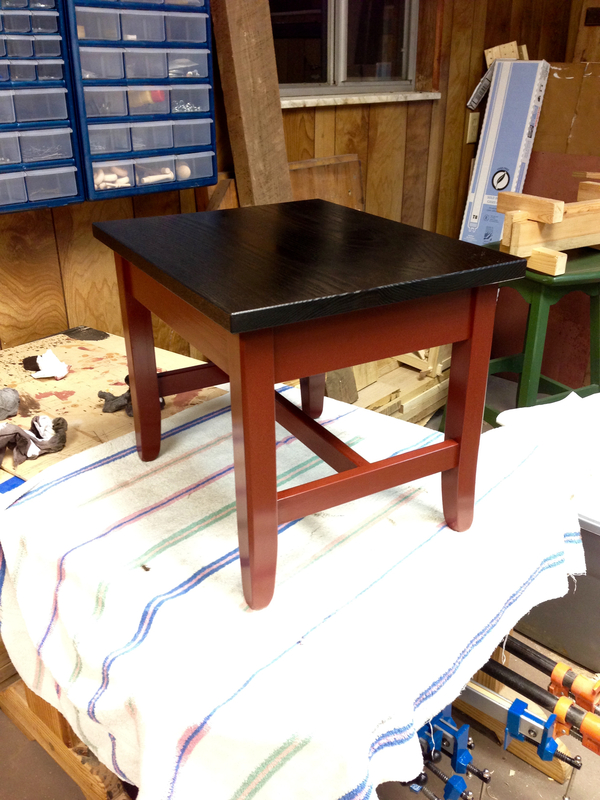 Then I rubbed out the milk paint on the base with 4-O steel wool. I’ve tried the synthetic stuff before, but actual steel wool works much better on milk paint and leaves a much better surface, IMHO. I don’t get too fussy about my steel wool. The stuff from the big box store works just fine for me. Milk paint is a little nerve wracking until you have used it a few times. I dries much lighter than you think it will and is rough as a gravel road. 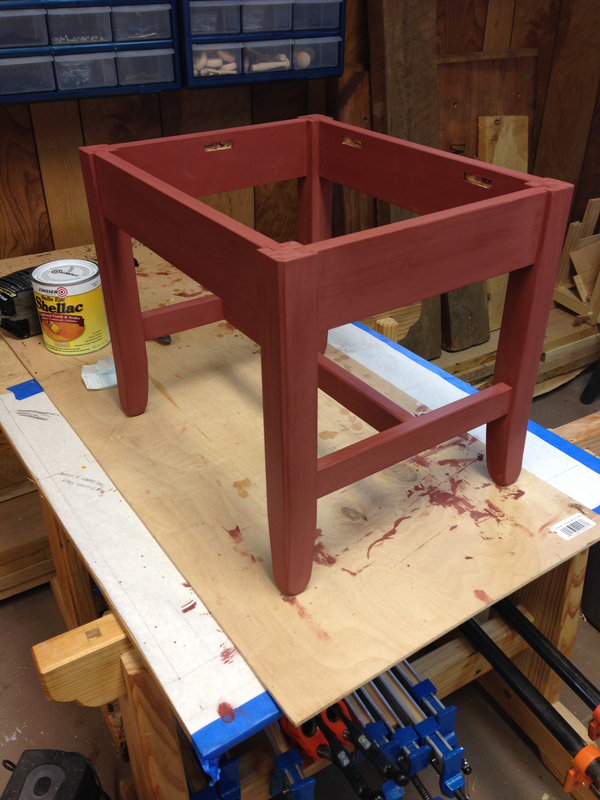 But once it’s rubbed out with steel wool and a coat of shellac is added, it really starts to look like something. 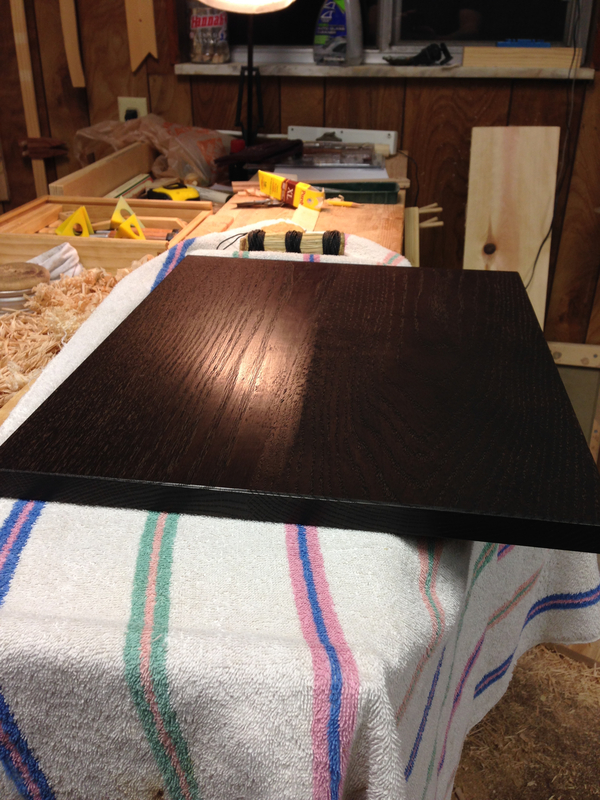 In all I added three coats of clear shellac to the base. 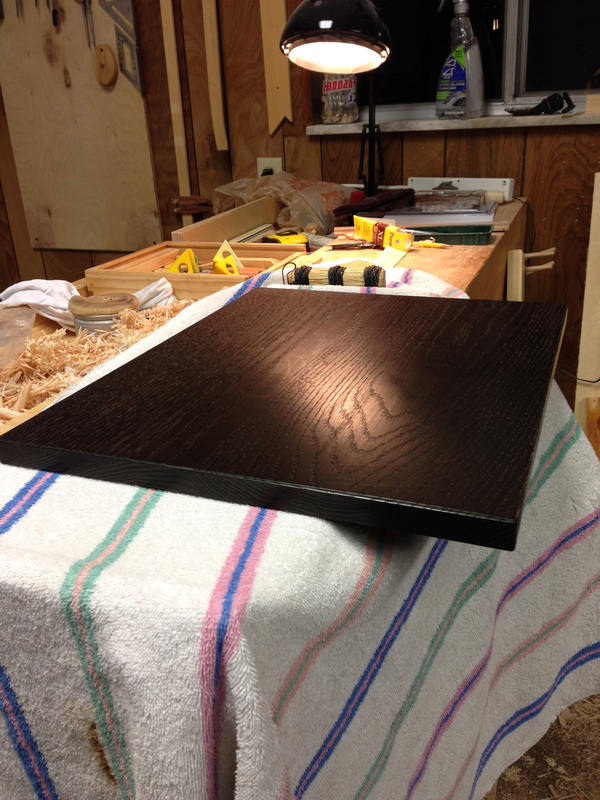 While that was drying I tackled the top panel. 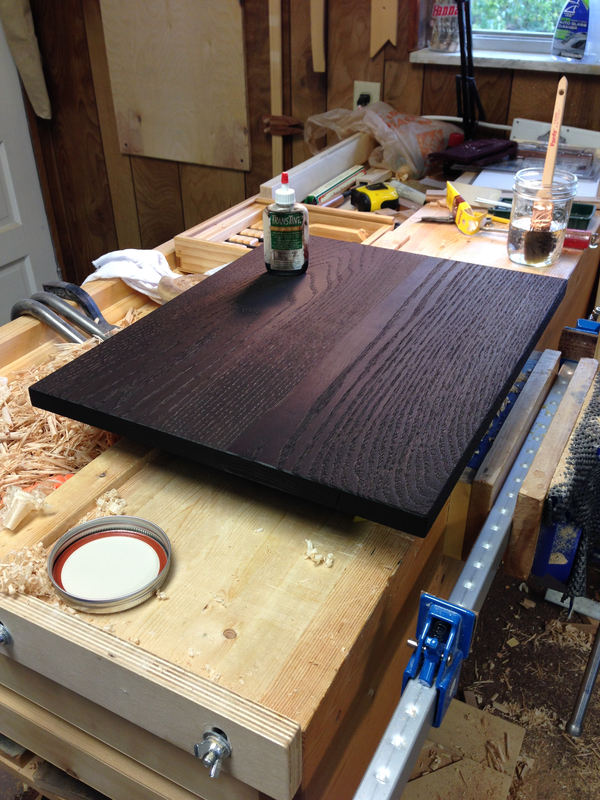 Following the same procedure that I used on the end tables, I first soaked in a coat of dark walnut Transtint dye. This is alcohol based and dries very quickly. Once dry, I broke out the polissoir and bees wax. Half of the panel done for a side by side comparison. All that remained was to rub out the shellac with 4-O steel wool, add a few coats of wax and attach the top with the turn buttons. 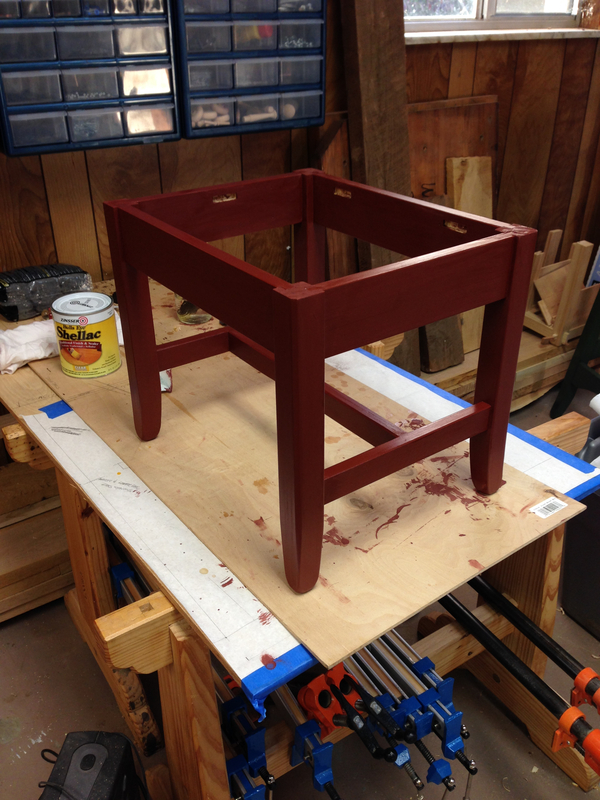 I applied two coats of dark brown Briwax to the entire assembly and topped that off with a coat of clear past wax. I’m happy with the way it turned out and I’m still surprised out how quickly I was able to complete it. It’s just a simple little table, nothing special, but it was a great way to get myself back into the swing after being out of the shop for so long. 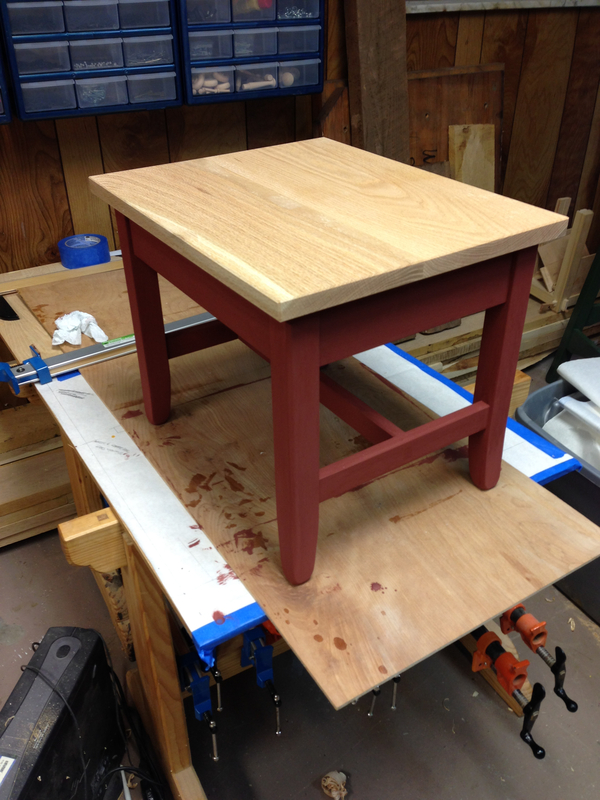 This little side table is already installed in the house and matches the end tables perfectly. It’s solid and will easily hold up my morning coffee and evening adult beverage for at least the rest of my life. It feels really good to have a shop and be back to woodworking again. I missed it. 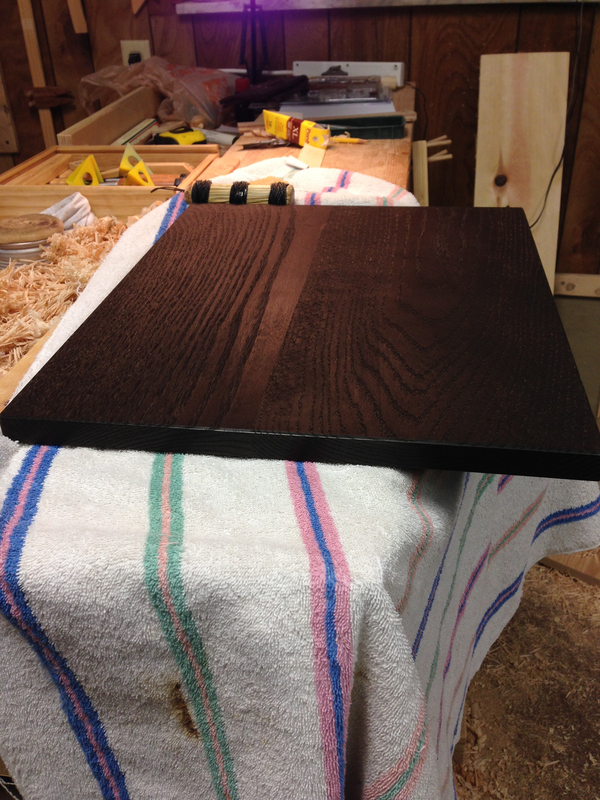 This entry was posted in Side Table and tagged briwax, finishing, milk paint, Polissoir, shellac, transtint. Bookmark the permalink. Congrats on the build and the shop. The table looks nice. I have to admit I was skeptical about the colors, but they look good together. And if it matches other items in the room, all the better. Thanks Matt. The color combo works surprisingly well with a good number of other colors and like I said it matches the end tables I built a while back. Thanks David. Yep, the Briwax is a paste wax. In this case I’m using it as a toner. I did buff between all coats. I did two coats of the Briwax just to ensure complete coverage. The final coat of clear seals in the Briwax and will be what I use for maintaining the piece from here on out. 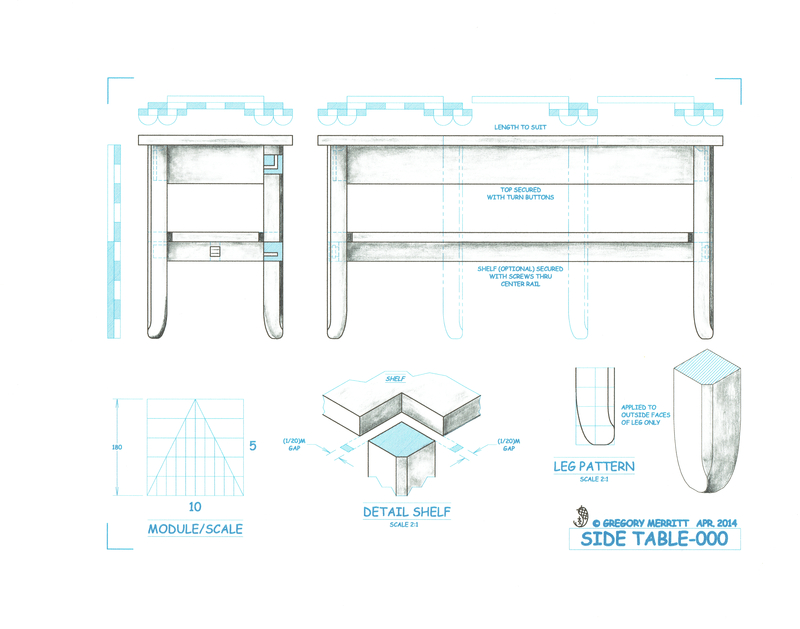 You called it a simple project, and many of us might see it as just a simple little table. Yet, when it is made as well as this one, it far exceeds the “simple” description. Great design proportions, subtle details, and “perfect” execution make it as nice, no – nicer, than anyone could want. Wow! Thanks Bob. You might be over selling it a little bit though. 😃 Still, very kind words and much appreciated and humbling. Thanks so much. It was a lot of fun. To say again, I love that leg design. I never considered the briwax/paste wax combo, but it looks great. I’ve been looking for a new finish and that just may be it. Also, I’m glad you have a new shop. I must admit, I’m a little jealous. Thanks Bill. Don’t be too jealous. I’m sure that its just a matter of time until the everyday “stuff” of life starts to erode my current setup. Until then I take what I can get and keep what I can.